Multi Tap Counter version 1.0 available in Apple App Store. 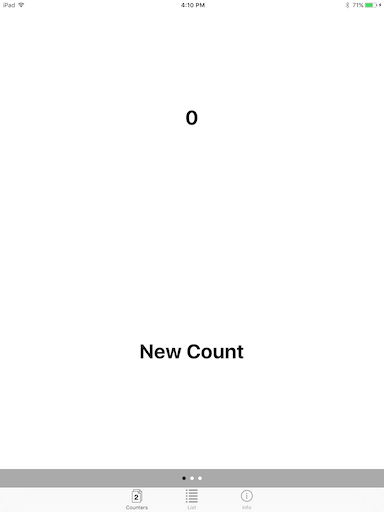 Multi Tap Counter is a universal iOS application that allows the user to count multiple items in a pageable format. The count can be either incremented or decremented by a set amount and when the count is changed a sound can be played and/or the device can vibrate. The list of count items can be edited by adding, removing or changing the order of items. Each count item can be customized by its description, count number, if item is to be incremented or decremented, the amount each time to be increment or decrement. 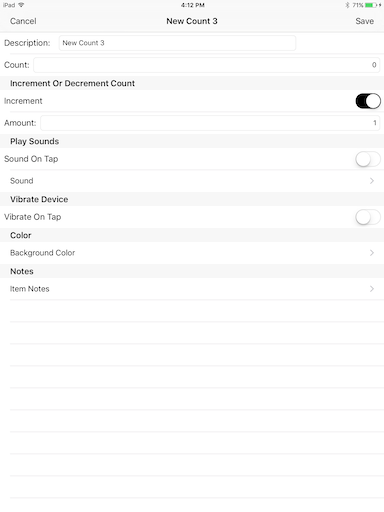 Also if a sound is to be played when the item is incremented or decremented and the sound to be played, the background color, if device is to vibrate when item is incremented or decremented. Notes can also be added to each count item. 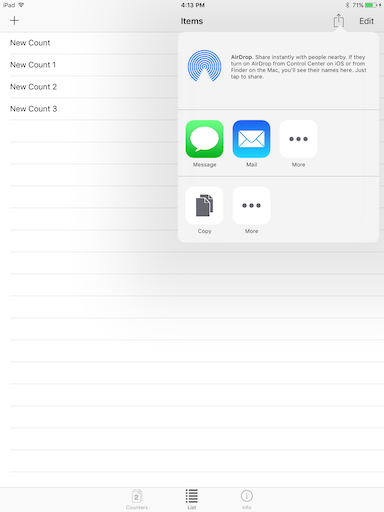 The application also allow the user to share the list of items, their description, count and notes by either message or email. Also the data can be copied to another application on the device. 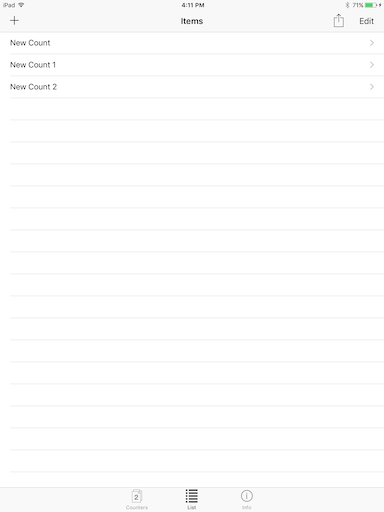 This is the count page where the user can increment or decrement the item count by tapping anywhere on the page. The user can move from count item to count item by paging thru the count items by swipping either left or right on the page. This page the user can edit the list of count items and share the list data. An item can be added, removed and moved in the list order. Item settings can be changed by selecting an item on the list and going to the settings page. This popup allows the user to share the list data with another user or copy the data to another application on the device. This page allows the user to change the settings of a count item. The user can change the count item description, the item count, if the item is to be incremented or decremented. Also if a sound is to be played on changing the item count and selecting the sound to be played. The user can also have the device vibrate on a change to the item count. The user can change the background color for an item and add notes or comments to an item count. 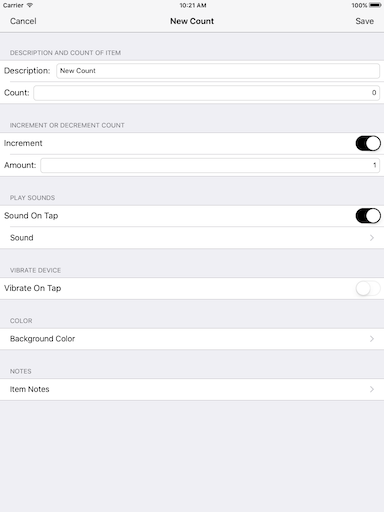 On the settings page the user has enabled the playing of sounds on increment and / or decrement of the item count. The user does not have select a sound because the application will default to the Tock sound. 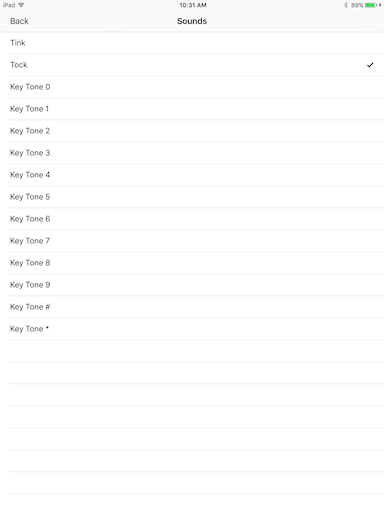 But to select a sound the user can tap the Sound row to go to the sounds selection page. On this page the user can select a sound to be played when the item count is incremented and / or decremented. The sound will play on a selection of a row from the table. On this page the user can select a background color for the item count page. 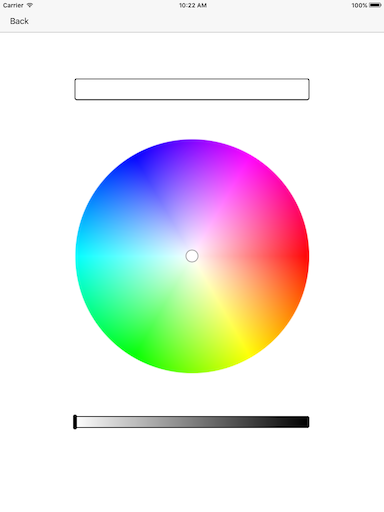 The user can select a color from the color circle by moving the light grey circle or tapping in the color circle. The selected color will appear in the top box (currently white the default). The user can also change the brightness by using the bottom box either by tapping or moving the slider bar. The change to the brightness will be reflected in the selected color box on the top of page. 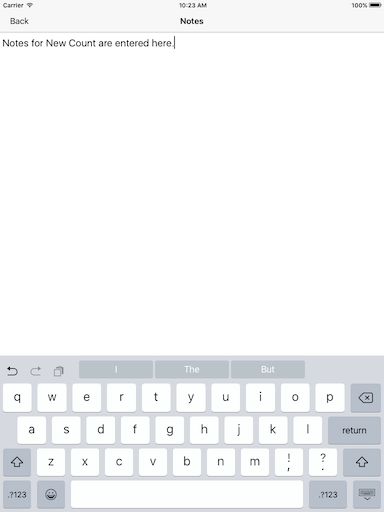 On this page the user can type in notes on the item count. The user has typed in Notes for New Count are entered here.